Love the idea, but you're a newcomer to sailing? No problem! Many of the folks who come out on our trips start out as total landlubbers. Attitude is way more important than experience... if you're easy-going, sociable and fun-loving - those are the essentials! A sailboat is not everyone's perfect vacation, however. Before falling in love with a romantic idea of sailing in the Greek isles, you should have a realistic picture of what life on a real sailing yacht is all about. You won't find any white-shirted crew running around on our yachts -- we're much more casual than that; and besides - this is an adventure, not a cruise ship! 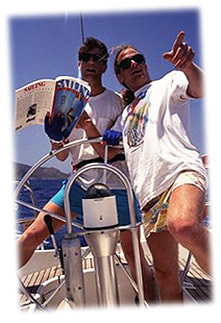 Team spirit is the essence of the sailboat experience; and that's how we run our trips. Sailing a yacht in the Greek islands sounds like a terribly glamorous thing to do, but a sailboat is NOT the Hilton - and if you need this kind of luxury for your vacation, you're on the wrong boat! Sailboats are for the adventurous traveller, who appreciates independence and flexibility, going where the wind blows and cruise ships can't! Sailing appeals to gregarious folks who enjoy the company of a small group of like-minded travellers and love the idea of actively contributing to the whole experience. And yes, that means you help do dishes sometimes, as well as more glamorous stuff like helming the yacht in 25 knot winds! If learning to sail isn`t your thing.. that's just fine (we don`t want everyone fighting over the helm! :>) But usually, most people find some way to contribute to the group energy maybe organising a cocktail party one evening?! If you're a newbie to sailingbefore booking any sailing vacationdo go take a look at a yacht in "real life", if you possibly can. Try your local charter company or sailing school. If you can't get to any of these, take a close look at the boat pics on our site. Sailing yachts are not cruise ships; they are very compact little homes. Eg, someone once described a boat "head" (bathroom) as an upright coffin. Yep, that`s about right! Another very apt label put on by one previous participant: sailing is like "camping on the water". Very up-market camping to be sure, but if this sort of concept appeals to you - you'll love it! The cool thing is - everyone else on board also thinks "camping on the water" sounds like fun, and like the casual, get-involved, easy-going, off-the-beaten-track approach - else they wouldn't be there! We've enjoyed some wonderfully FUN groups - resulting in friendships that have lasted years beyond tying the final dock lines at the end of the trip. And of course - the sailing itself! There's something very unique and totally thrilling about exploring the islands under sail, at one with the winds and the ocean. It's the contrast and variety that sailing always offers - one day calm winds and complete tranquility; the next day...maybe the thrills and excitement of a 25-30 knot breeze!